Welcome to the first installment of Foods My Husband Will Not Touch with a Ten Foot Pole. If I were to actually continue this train of thought I could probably fill up the rest of the year with posts in this series. There are so many foods my husband will not eat for whatever reason. Mushrooms, peas, corn that’s not on the cob, candy of any kind, frosting, cream-based sauces, shellfish, ham, turkey, any part of the chicken besides the breast. The list goes on and on. “Green foods” is on that list. There’s no Doofenshmirtzian back-story here. He was never traumatized by a bad avocado experience or anything like that. Apparently as a baby he wouldn’t eat green veggies and has just never gone back on it since then. He’s kind of stubborn like that. So yeah, vegetables…it’s like I’ve got five kids in the house I have to constantly beg, nag, and cajole to eat their food. And avocados – not even a real vegetable. It’s totally a fruit. That’s full of good for you fat at that. So where were we? Oh yeah, egg salad, baby. 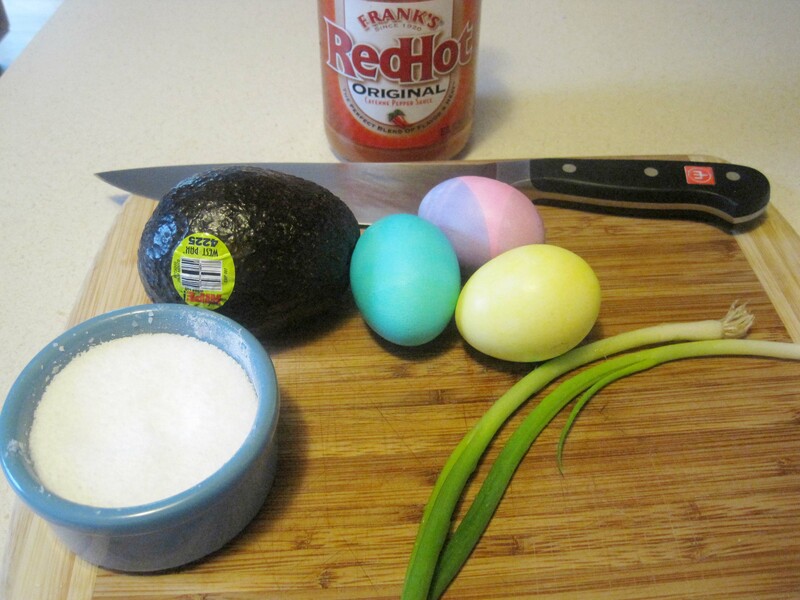 Now, normally, I do my egg salad with a mayo/dijon/horseradish dressing. And it’s awesome. But, I had all these Easter eggs sitting in my fridge staring at me (last month – I know – been super busy ’round here) and I got inspired. And you know what? I ended up making myself this egg salad for myself for breakfast every day for like a week. Here’s everything you need. 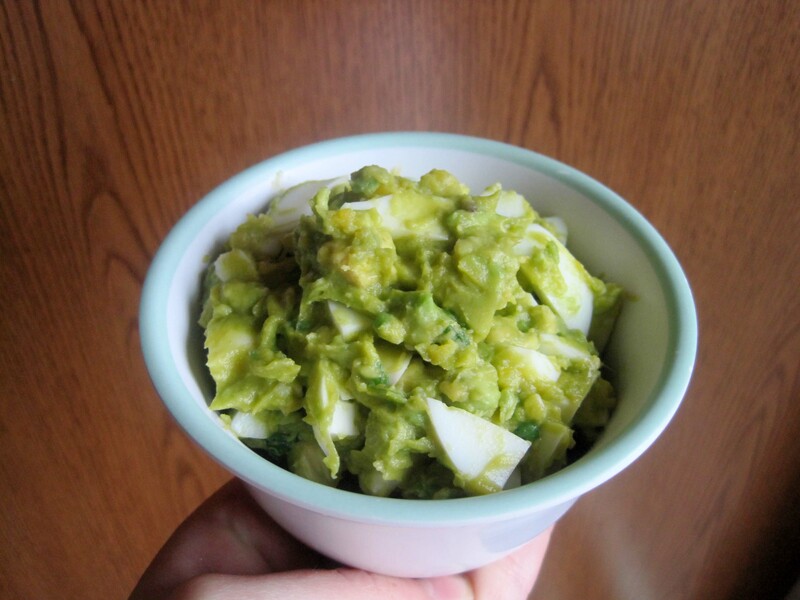 A mashed avocado, three chopped hard boiled eggs, two finely chopped green onions, a pinch of kosher salt, and a few dashes of hot sauce (I ❤ RedHot). Put it all in a bowl, mash it up, you’re done. Now, if you like your egg salad more eggy you could go four eggs instead of three. Up to you. This recipe easily doubles/triples/whatever you need. Here he is being a good sport. No pole or anything. 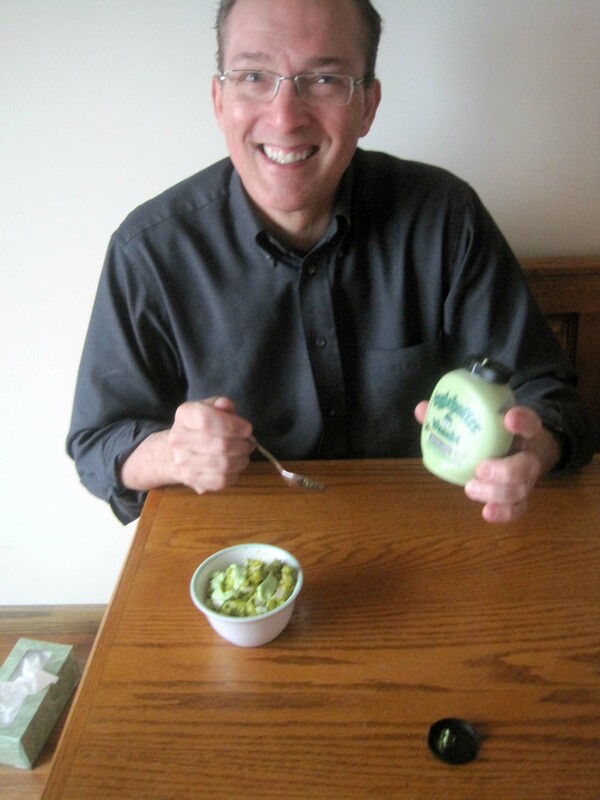 But check it out – wasabi is not included in the green foods ban. Combine and serve. If not consuming right away, press plastic wrap directly onto surface of egg salad to delay the natural browning of the avocado.